Week 2: Cookies in Faribault! Since last week we made pizza, we had to follow it up with another classic: chocolate chip cookies. The lesson was dual-purposed. We wanted to teach the young chefs the essential art of making one of the tastiest treats and we also wanted to teach the young chefs about the scientific method. To start the process, we brought a batch of cookies that had been made earlier in the day. These were the control and were prepared according to the recipe. We passed around a Tupperware container filled with the cookies to the large group and explained the core principles of the method. The independent variable is the variable that is manipulated, the dependent variable is the measured response to the manipulated variable and forming a hypothesis, or an educated guess, about the outcome of an experiment is an essential part to any experiment. To many of the volunteers’ amazement, the container with the cookies was largely ignored as it went around the circle. I hypothesized that this wouldn’t be the case when the lesson was over. From there, the young chefs broke into four groups. In their groups they each decided on one variable to change to the cookie recipe. For instance one group exchanged brown sugar for white, another melted the butter prior to mixing it with the ingredients, and the third replaced baking powder with baking soda. Then the chefs made their predictions on what would happen. The guesses ranged from differences in texture to speculations about the taste. Once the batter was made and the cookies had been put in the oven, the chefs got to taste the leftover dough that had clung on to the mixer and bowl. Some were skeptical since they had never tried cookie dough before, but after trying a finger full, all were convinced about the magnificence of cookie dough. 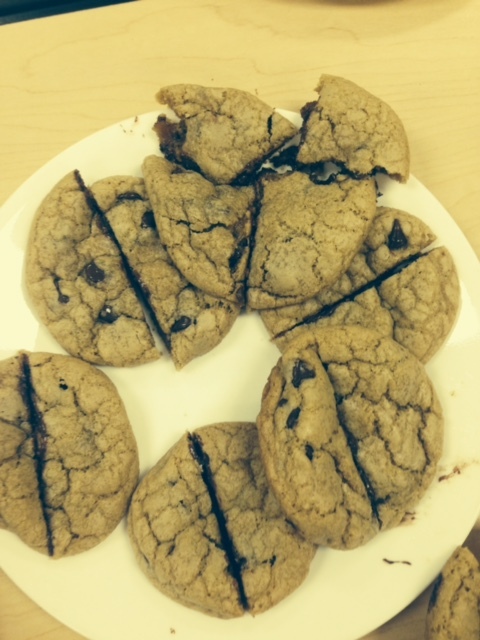 Once the cookies came out, the young chefs got to compare the results to what they hypothesized. The melted butter lent a thinner cookie, the baking powder made the cookie cakeier, and the brown sugar made the cookie have a butterscotch taste. In addition, each group was able to go around the room getting to observe and taste the different variations. The experiment was a success!